This is the workshop. I say workshop. I use the term loosely. It also doubles up as a place to store junk, which is one of my main hobbies. In the image below, Dad and Dave Mills are setting up Dave’s QRSS beacon. 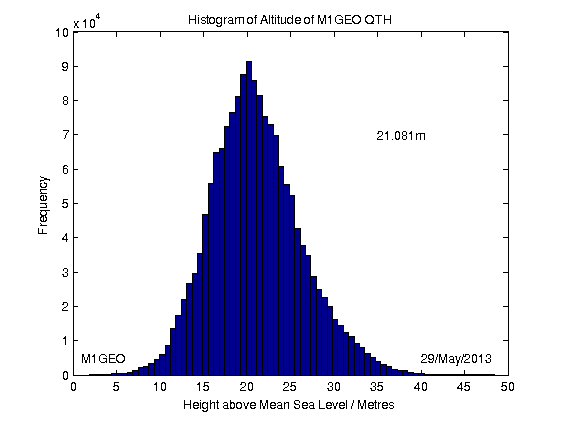 This histogram shows altitude samples taken from a GPS receiver, at one sample per second for a month. Then using the central limit theorem or more directly the law of large numbers we are able to observe exact altitude much more accurately than the GPS is able to measure in any single measurement. The average here is 21.080879814928682 metres. For sensibility I’ll say 21.08 metres above mean sea level (or whatever GPS thinks is mean sea level).